The last time I sharpened a pencil was when I took my licensure examination to become a Chemical Engineer. Before that, however, the last time I probably sharpened and used pencils on a regular basis was in third grade, before we made the switch to ballpoint pens. If you miss the good old days when you still had to sharpen up stuff, then look no further than the Parmesan Pencils. Aside from letting you sharpen to your heart’s content, you can also serve it up and top the shavings on your food to complete your dishes. The brainchild of these cheesy pencils was Germany-based ad agency Kolle Rebbe, who took on the project for a cooperative called The Deli Garage. 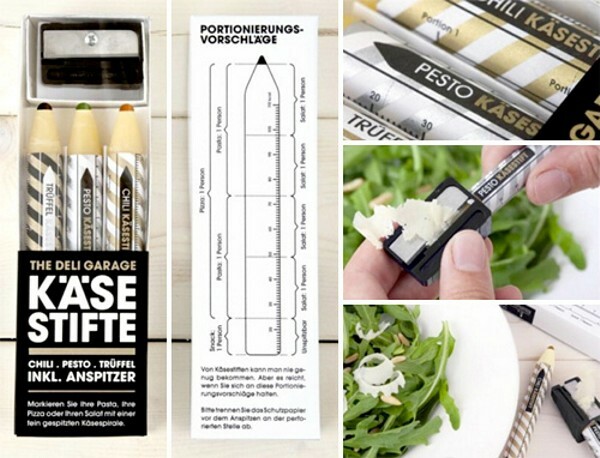 The Parmesan Pencils came in three flavors: truffle, pesto, and chili. The shavings make for a different way of topping your food off with cheese and gives you more choices and leeway to come up with cool presentations of your food. The bad news is that the pencils were made in a limited run of 500 and sold out in just two weeks. But maybe Kolle Rebbe will reconsider and start churning out these Parmesan Pencils for good, because I’d sure love to have me some sharpenable cheese.